During the garden season, when I’m working in, thinking about and writing about my Maine garden, I tend to focus on one area at a time. But during the winter, when I am working on the garden of the imagination, I find that it helps to step back and look at the big picture. 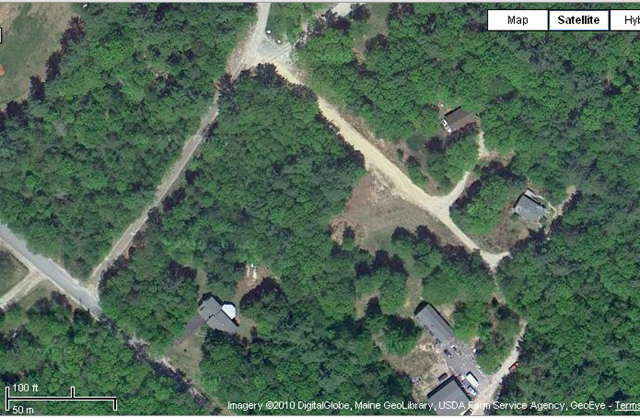 As you can see in the aerial view (from Google Earth), my house (on the upper far right) is one of a cluster of houses on a dirt road in a rural neighborhood that, like most of the state of Maine, is heavily wooded. 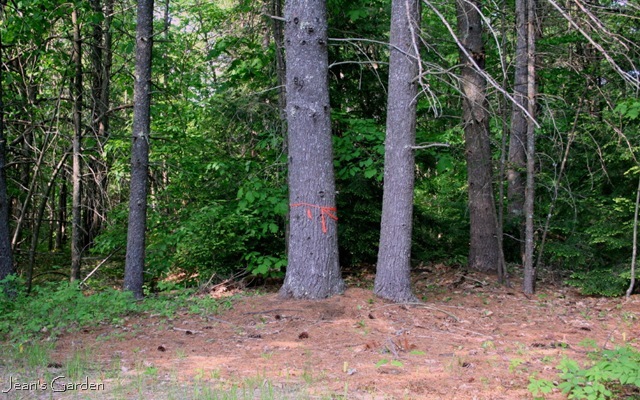 Except for the cleared area immediately around the house, most of my 1.5 acres of property is covered with trees. 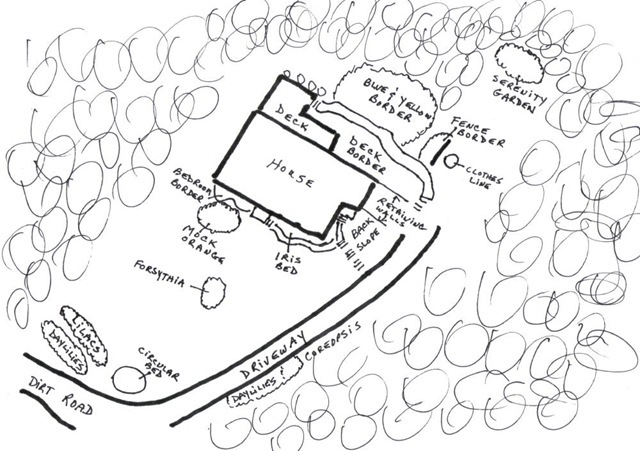 The diagram below shows the cleared area around the house, with the various garden areas labeled. 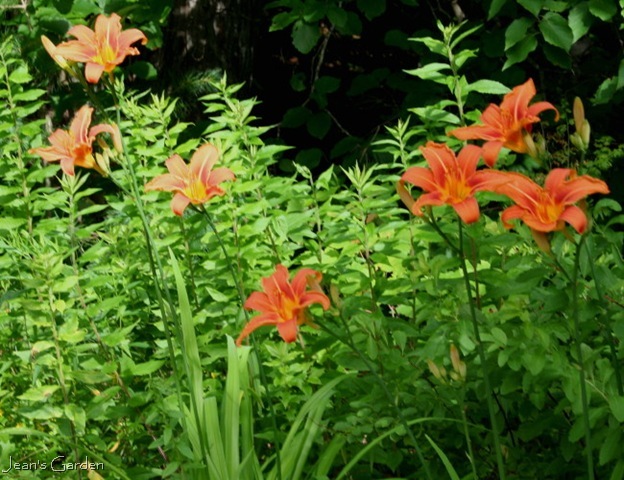 If you approach on the dirt road in July, you will be greeted by the cheerful yellows, reds and oranges of a row of daylilies growing at the front of the property. 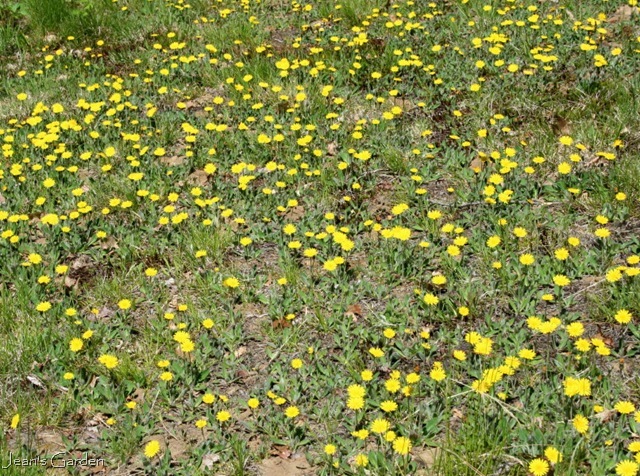 and yellow hawkweed (Hieracium pilosella) that carpets the ground in summer. As you reach the top of the driveway, you have two choices. You can climb a flight of stairs to your left up a fairly steep slope to the main entrances to the house, or you can proceed up a shorter set of stairs straight ahead that lead into the back garden. If you go up the longer flight of stairs, the main garden interest is the back slope to your right. This garden area is dominated by a large rhododendron at the top that spills pink blossoms down the slope in late spring and by wild strawberries (Fragaria virginiana) that have been encouraged to naturalize on the bottom half of the slope. 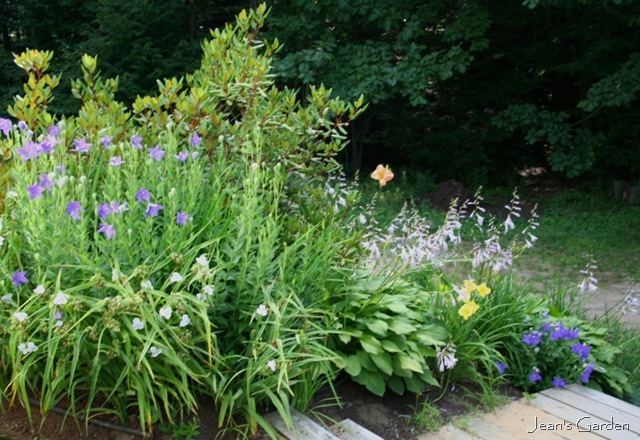 Surrounding and interplanted with the rhododendron and strawberries are a pleasing jumble of hosta, Tradescantia virginiana, Siberian irises (Iris sibirica), Coreopsis verticillata, daylilies (Hemerocallis), balloon flower (Platycodon), oregano, and chives. If you follow the pathway around to the left at the top of the stairs, you come to two unremarkable flower beds at the front of the house. The iris bed shines in early June when it blooms with two different varieties of old-fashioned blue and violet Siberian irises and Tradescantia virginiana ‘Zwannenburg Blue.’ The bedroom border is an unsatisfying hodge-podge that I am slowly dismantling as I move plants from this area to other parts of the garden. Without doubt, the best part of my garden is the back garden, which you enter by taking the short flight of stairs at the end of the driveway and following the paver and gravel walkway. The back garden is currently made up of three flower beds: the deck border, which runs along the full length of the walkway between it and the house, the blue and yellow border, which sits opposite the deck border along most of the walkway, and the fence border, which runs perpendicular to the walkway. The deck border is in the shade of the house for part of the day, so it is planted with shade-tolerant plants like hosta, astilbe, heuchera, and hardy geranium, as well as with Siberian irises, daylilies, goatsbeard (Aruncus dioicus) and a mass of Spirea japonica ‘Magic Carpet’ above the retaining wall at the sunny end of the border. The predominant colors of this flower bed are pink and lavender. 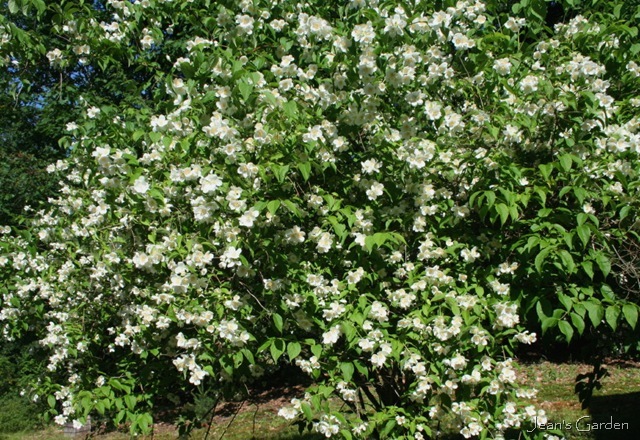 It’s appearance is soft and peaceful, and foliage is a major presence. 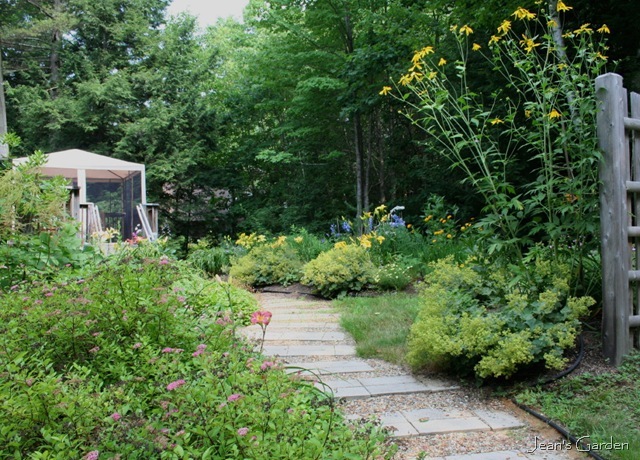 The blue and yellow border, across the walkway from the deck border, gets more sun and has more emphasis on flowers. 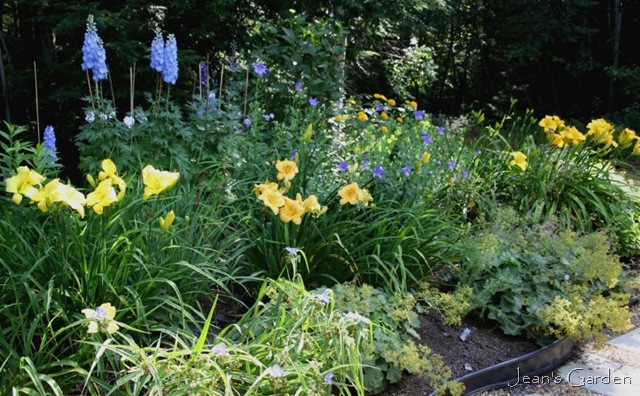 Here, the blues of Iris sibirica, Tradescantia virginiana, hardy geranium, perennial flax (Linum perenne), Delphinium, and Platycodon grandiflorus (balloon flower) combine with the several large groupings of yellow daylilies, with the yellows of Coreopsis verticillata, Heliopsis helianthoides (false sunflower), Rudbeckia ‘Herbstsonne’ and native goldenrod (Solidago), and with the chartreuse blooms of Alchemilla mollis (lady’s mantle). The fence border is the newest flower bed in the back garden, having just been completed in summer 2010. It is a smaller flower bed than the others, but serves a number of important functions, including screening the clothesline from the deck, creating a sense of enclosure in this part of the garden, and tying together the deck border and the blue and yellow border by repeating colors and plants from both. 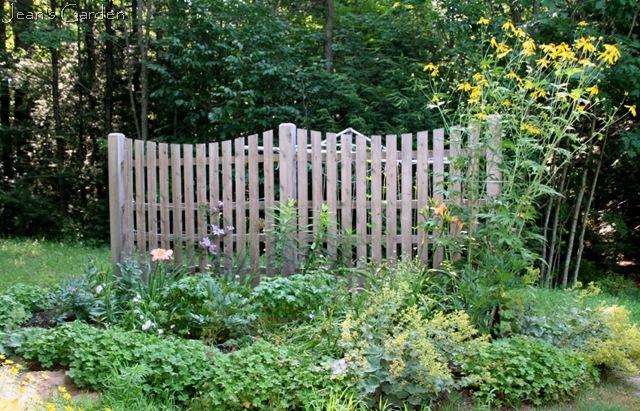 The fence also provides a place to grow climbing plants, including clematis and morning glories. The fence border still had a gawky, adolescent look in 2010, and I’m looking forward to seeing it mature. Like all gardens, mine is always growing and changing, and I always have more garden project ideas than I can possibly carry out in the foreseeable future. You may have noticed that the garden diagram at the top of this post included a notation for another area, the serenity garden, beyond the current back garden. This serene woodland retreat is part of the garden of the imagination. Right now, it exists only as a few stakes in the ground to mark its boundaries, a series of photographs showing patterns of light and shade, a growing list of plant possibilities, and some wonderful images in my mind’s eye. My major garden project for this winter is to transform those ingredients into a plan on paper, and I expect to begin digging and planting this new garden area in summer 2011. This project, which will probably take 2-3 years to complete, will also involve creating a sense of seclusion for this part of the garden by adding some plants and garden structures to separate it from the clothesline area and the the driveway beyond (see My Not-So-Secret Garden). While this project is being completed, I also expect to put an addition on the front of my house, and this will create both the necessity and the opportunity for a complete re-landscaping and new garden design at the front of the house. The row of scraggly lilacs will go, as will the bedroom border, and both the forsythia and the mock orange will have to be moved. 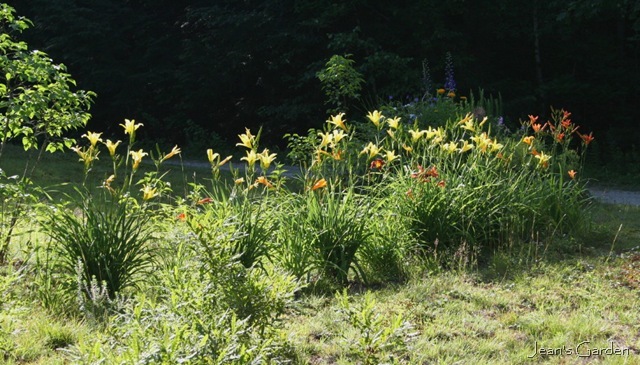 The circular bed will stay, and I hope that the new front garden will include revised versions of the iris bed and the row of daylilies at the front of the property. As I look at the big picture of my garden, I can see enough garden projects in the garden of my imagination to keep me going for at least another decade! Donna, The back garden is where I hang out in the summer. I sometimes take my computer and telephone out onto the deck and turn it into a garden office — but it isn’t always a good way to get work done, because I get sidetracked by gazing at the garden. I do love that image of the path drawing a viewer into the garden; I used that one as the cover of my calendar this year. 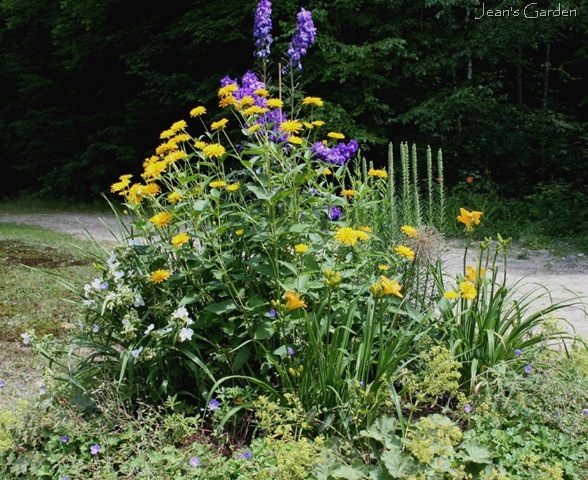 Jean, You have a lovely property, and I love what you’ve done with it, especially that bed with the delphiniums and daylilies – yummy! It’s nice always to have new projects and areas to work on – who wants to be finished? Cyndy, I’m glad you enjoyed the tour. I agree that a garden is never “finished,” but as I get older, I’m going to need to rethink what kinds of projects I can take on. I once calculated that, in the creation of the deck border and the blue and yellow border, I had hauled and dug in 1 ton each of manure and compost! I’m not sure how many more years I’ll be able to do that kind of heavy lifting. Although, when it comes to outdoor work, I am definitely my father’s daughter, and he was going strong on heavy-duty projects well into his seventies. wow Jean you’re so incredibly organized. So many great ideas and thoughtfully carried out. I’m terribly impressed since I have a zillion ideas it seems and scraps of paper floating about office and home with jotted plants and scribbles. I completely understand the thought of the time needed to carry out your plans. After last summer I’m beginning to see just how long it could take me to carry out my multiple plans. 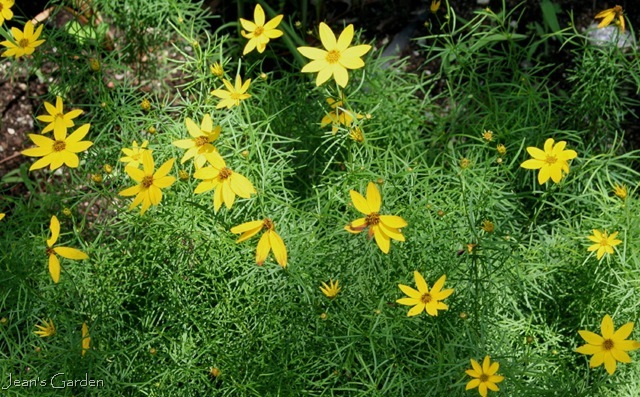 Marguerite, I’m not the sort of gardener who begins with a grand design for the whole property. I’ve developed my garden one flower bed at a time, and a lot of the success has been luck and serendipity. The time dimension is particularly important for me because I do my gardening work alone. Sometimes I look out at the back garden and am amazed at what I have created there in 10 years. The deck border went in in years 1-3, the blue and yellow border in years 3-4, the walkway and stairway down to the driveway took another 4 years (5-8), and then the fence and fence border were the projects for years 8-10. Whew! I think if I had envisioned that many years of work when I began, I might have been too discouraged to continue — but focusing on one flower bed at a time has made it doable for me. I really appreciate the overview of your garden. Your property is lovely! Good luck with all your projects. I especially like the idea of your serenity garden and look forward to seeing its progress. Projects never end in a garden, do they? I suspect that when I am ninety, if I’m alive and able, I will still be out there planting flowers and trees, my mind swirling with ideas for the next season. Deb, I’m excited about the serenity garden and I’m really looking forward to getting started on it in earnest this year (after thinking about it for a long time). I don’t know if I’ll still be developing new garden project when I’m 90, but I think my current plans will take me to 75! I was smitten by the blue and yellow garden, the first time I saw it. It is still my favorite online image. Allan, the blue and yellow border seems to be the most photogenic part of my garden, and I love it. I must admit, though, that when I’m out in the garden, it is often the deck border that mesmerizes me. There’s something about it that is so calming, a meditative feel that I think may actually lower my blood pressure. It’s that same quality that I’m hoping to capture in the new serenity garden. Your flower beds are exactly the sort I want; beautiful, informal and generally lovely. I hope one day to be able to post pictures of similar flower beds. Soren, What a wonderful compliment! Thank you. What a great entry! I feel like I understand your garden so much better, and in a way, I understand you. It seems like every gardener has some big picture in their head, and this post gave me a peek into yours. I particularly love the aerial and the plan–the landscape architect in me says “oh, now I get it”. I’m sure this entry took some effort. A big thank you for sharing it. The property is lovely and the garden makes it all the more endearing. Your themed gardens have inspired me. The garden looks great Jean, love the drawing of your property. Thomas and Eileen, I’m glad that you enjoyed the satellite image and the drawing. I often find graphics really helpful in getting an understanding of something. (I love maps.) I’ve been wanting to create a graphic of my garden for a while now; the problem has been that I can’t draw worth beans. So it was great to find the satellite image of my neighborhood on Google Earth and then discover that I could actually zoom in on my house and property. Amazingly, you could actually see my walkways and the outlines of my plantings in the satellite image! So I printed it out, used a dark marker pen to outline the important features and then traced them onto a clean piece of paper. You would have laughed to see me creating a light box for the tracing by placing a glass plate on top of a large flashlight. But, hey, it worked! Your gardens are beautiful, and I hope you won’t take it the wrong way if I say that what I really covet are your native woods. I can create beautiful gardens on my property, but I can never duplicate the undisturbed, majestic PA woodland that was here ever so long ago (although I try). In Maine, at least on my island, the combination of plants in the woods is more beautiful than anything I could ever create. 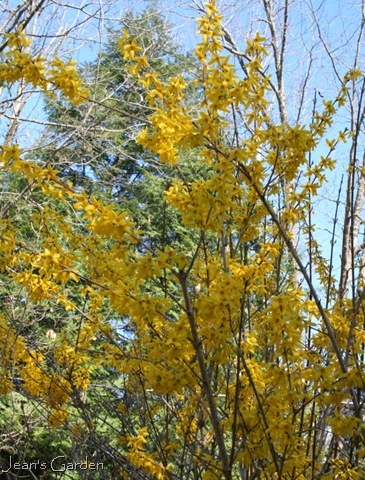 Are your woods still thriving or have they been destroyed by invasive plants like all the woods in SE PA? Jean, How lovely! It is great to see the complete overview this way and I would agree you have a large imagination, plenty of land and many years to fulfill your dreams. You do have thousands of trees all around you! Wonderful! Carolyn and Carol, I love the woods around my house. When I looked at the property, it didn’t have any garden (except for a few shrubs dotted here and there); the previous owner was not an outdoor person at all. It was the woods I fell in love with and the sense of quiet seclusion of being tucked away in the woods at the end of a dirt road. 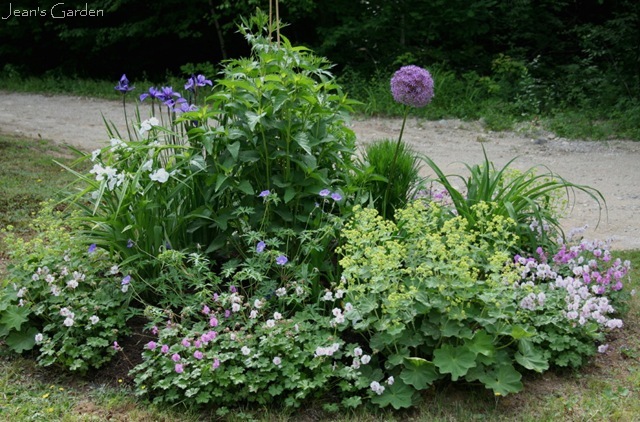 Carol, I used to think I might like to make some new perennial gardens in areas that are now wooded, but I’m now committed to leaving the woods untouched and focusing on plantings in the areas that are already cleared. Carolyn, The woods are relatively healthy here. The invasive plants we have are mostly seen along the side of the roads (especially purple loosestrife and Japanese knotweed); I’m not aware of a big problem of invasives in the forests. The forest problem here is with tree diseases and pests. The one I’m most concerned about is the Hemlock Woody Adelgid, which attacks and kills Eastern hemlocks (Tsuga canadensis); the woods around my house are pine/hemlock forest mixed with deciduous trees. Jean, I planted a row of hemlocks at the bottom of my property, the place that all the water drains to and the only location that can be described as moist. They have not been bothered by wooly adelgid the way other hemlocks on the property have although I have seen adelgids on them. I think many of these infestations occur when the tree is stressed for other reasons, in the hemlock’s case, lack of water. I would be more worried about the stresses of acid rain on your trees. Hello Jean, and greetings across the miles that can sometimes seem so short… thanks for this post – I was right there in your garden and – more importantly I often think – with you in your mind as you plan and dream! Jean, i am overwhelmed by the size of your garden, which you change with different character depending on seasons. Do you have help in the preparation? It surely takes lot of man-hours! Jack and Andrea, thanks for visiting. 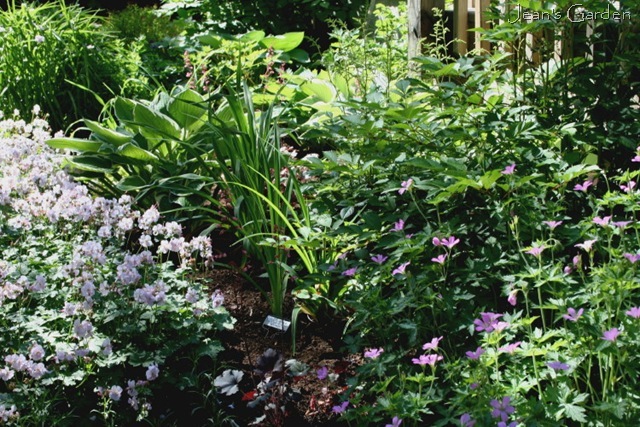 Jack, I had been thinking about this post for a while (I’ve also used it as an update to my “garden tour” page), but I think your post that showed all the different parts of your garden inspired me to get moving on it. Andrea, I have done almost all the work on the garden myself, and it has definitely been a lot of woman-hours! Fortunately, my sandy soil is easy to dig — but, at the same time, because it has so little organic matter in it, I have to add tons (literally) of manure and compost. I now have a truckload of compost delivered each spring. During the garden season, I work on healthy bones by wheeling a loaded wheelbarrow around, and I keep my heating pad by my bed for relief of my aching back! I love the colors you have in your garden. 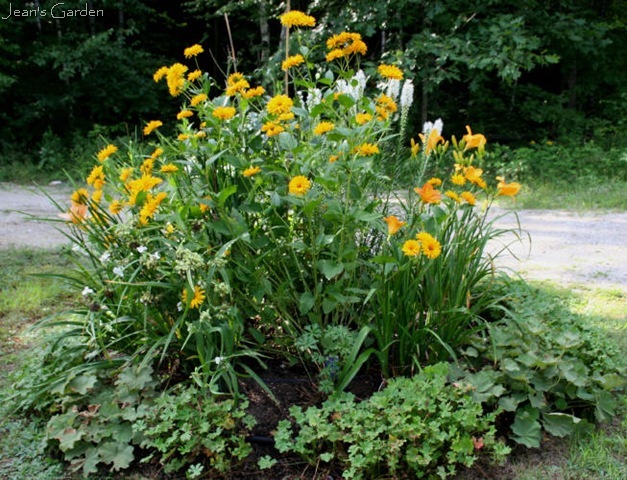 Your circular bed is so well planned for the changing seasons. It looks beautiful!! It is fun to see how the parts fit together, and change skilfully thru the seasons. Mine just takes me by surprise. The blue and yellow border is definitely one of the stars of Blotanicalland! Amy and Diana, I loved your assumption that I skilfully planned the circular bed to change through the seasons. LOL. In truth, it was one of those wonderful bits of garden serendipity. When my garden presents me with pleasant surprises like this, though, I do try to learn from my happy accidents so that I can repeat the effect more intentionally elsewhere. Noel, Aren’t the Google Earth photos amazing? When I first looked at it last year, the satellite photo of my neighborhood was several years old; but when I looked again recently, lo and behold, it was a photo taken this past summer. I couldn’t believe how much detail I could see when I zoomed in on my property. I’m sure I’ll be able to provide photos of ground breaking on the new serenity garden this summer; we’ll see how much further than that I get. Isn’t Google maps great, I often use it to get a good birds eye view of clients gardens when designing. Sunny, I can see what a great tool this would be, especially if the photo was recent. I was absolutely blown away that I could actually see the flower beds and the walkways, and even the piles of paving stones that I’d had to move to have work done on my septic system and hadn’t put back yet when the picture was taken! Liisa, You’ve had a lot on your plate, but I imagine that, like me, you’re looking forward to some time to work on garden projects this spring and summer. BTW, the mayapple you gave me will be part of the planting in the new serenity garden. I do hope you’re at work on a book – a garden journal that will capture your musings! It’s not just that you’re ambitious, but you are also so clearly organized and accomplished in the garden realm (as well as in your chosen profession). Sorry I don’t have more time to comment. There are simply not enough hours in the day. Alice, what a nice thing for you to say! I do have vague ideas about a book of garden essays, but it’s not yet at the stage that I would describe as “working on it.” I see it as a project to take up when I retire from teaching three years from now. When I started blogging, it was because I wanted to write about my garden for an audience, and I’ve found that I really enjoy this sort of writing. As I move toward retirement, I’ll be doing some more thinking about the form a book might take and how to give it some kind of coherence. Thanks so much for the encouragement; it means a lot to me. Gardens of the imagination keep all of us aging gardeners young. A beautiful tour of your garden Jean. Isn’t Google Earth fun? I was feeling overwhelmed, and frustrated at the progress in our orchard last year. Then I compared the current GE image to one from just before we moved in. I went from overwhelmed to smug and happy in about 2.5 seconds! A new addition sounds exciting. We not adding on, but have been excavating a sinkhole in front of the house (the front ‘garden’ is no more), and we’re remodeling part of the house this year. It’s amazing how fast builders can remove any trace of greenery in the garden. Once they’re done though, like you, we’ll have a blank slate to start over with, which is quite an exciting prospect! Oh, I had so much fun touring and looking around at your gardens! Finally a little time. I often look up my old house in Maine on satellite. Yes, woods, woods, more woods. So fun to see yours. Your gardens are beautiful. I envy those delphiniums. I can’t wait to see the secret garden reveal itself! And the new addition! Wow, so glad I stumbled across your beautiful blog!